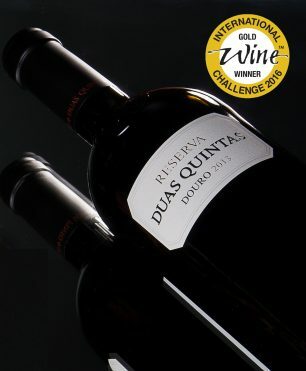 The Duas Quintas Reserva 2013 has been awarded a Gold Medal at the International Wine Challenge 2016. The famous Port House, Ramos Pinto, produces Duas Quintas, exceptional red table wines from the Ervamoira and Bons Ares vineyards in the Douro region of Portugal. The Reserva is made from hand harvested grapes vinified in granite wine presses and stainless steel tanks, depending on the plots. Twenty percent of the wine is aged in wooden tonnels and eighty percent in new and one year old barrels. This award winning wine is intense, dark garnet in colour with aromas of luscious dark red fruits and undertones of toasty oak and wild herbs.